February is one of my favorite months. Not only do I get to celebrate Valentine’s Day, it’s also my birthday month! So it only seems right to indulge a little bit during this special time. I love a good treat, but; my goals aren’t being pushed to the back burner just to enjoy it. This weekend, I went to the drawing board. Grabbed my favorite Premier Protein chocolate milkshake whey protein powder and made a protein shake that is not only good for me, helped me reach my protein goal that day and the taste was so decadent, I really felt like it was naughty. Maybe it was a little naughty, but turned into a protein shake that I thoroughly enjoyed! And, the macros weren’t so terrible that I couldn’t enjoy this every so often. We all deserve a little enjoyment from a treat now and then. 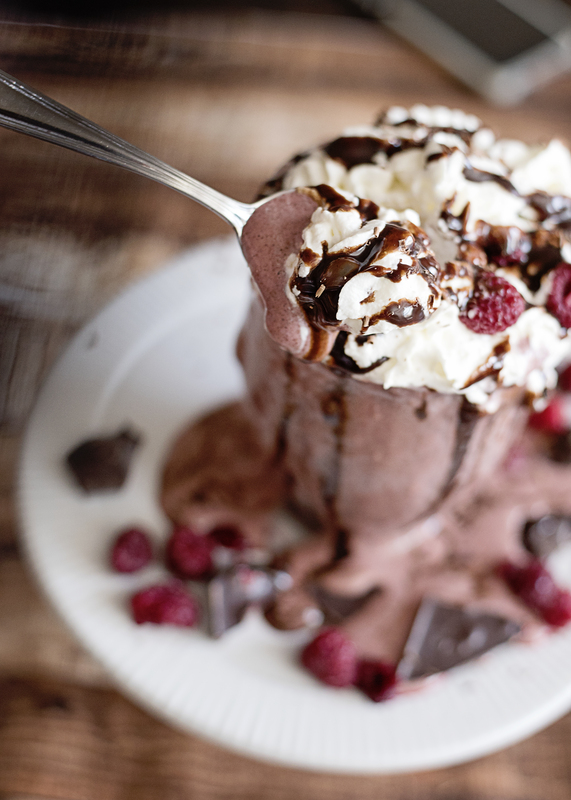 Chocolate and raspberries are one of the best combinations. Some say strawberries.. but for me, it’s raspberries. I have a thing for this Chocolove raspberry chocolate bar and this became my inspiration. The Premier Protein chocolate milkshake whey protein powder combined perfectly with the Chocolove! 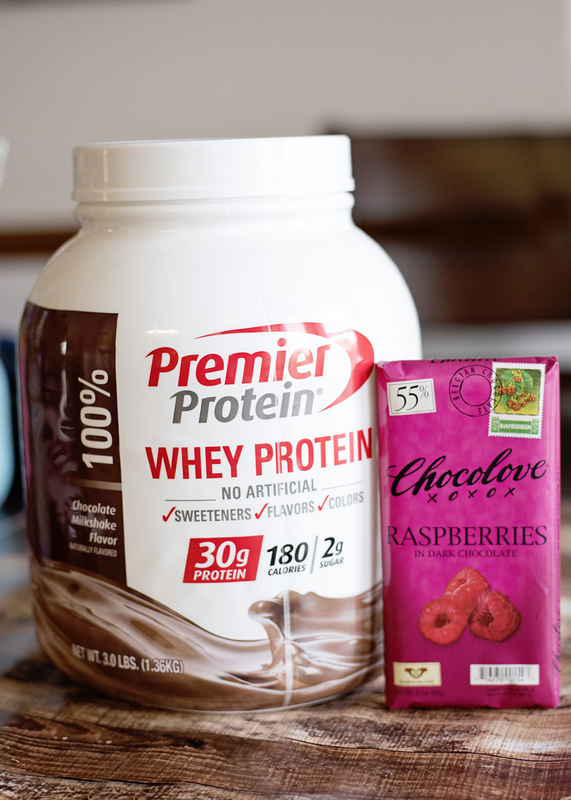 And with Premier Protein whey powder having 30g of protein, only 180 calories and 2g of sugar, it was a great option to help keep this chocolate raspberry protein shake more on the healthier side of things. 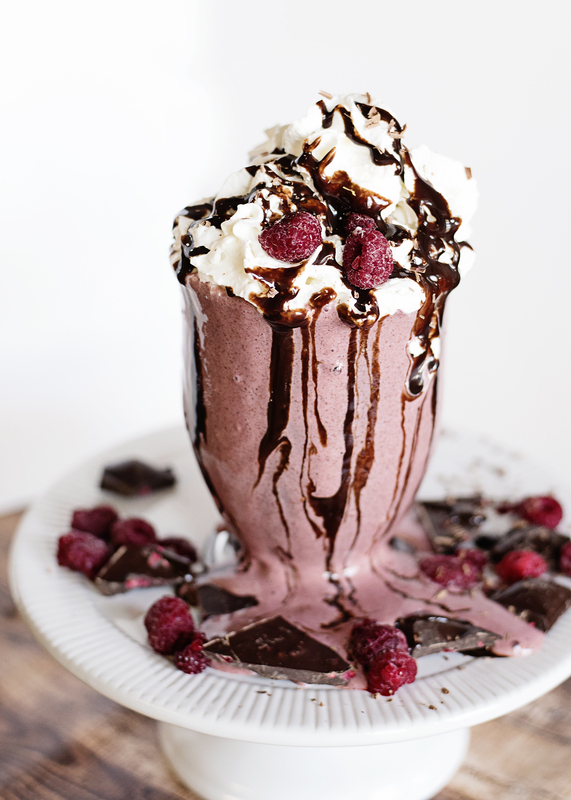 So right off the bat, this chocolate raspberry protein smoothie looks like it would kill your diet. Right? I included the Premier Protein whey powder, some frozen raspberries, unsweetened almond milk and that was it. If you need it a little more on the sweeter side, you could even throw in a date or two. The toppings are totally optional, but I topped with a little whipped cream and a few chunks from my Chocolove raspberry chocolate bar. 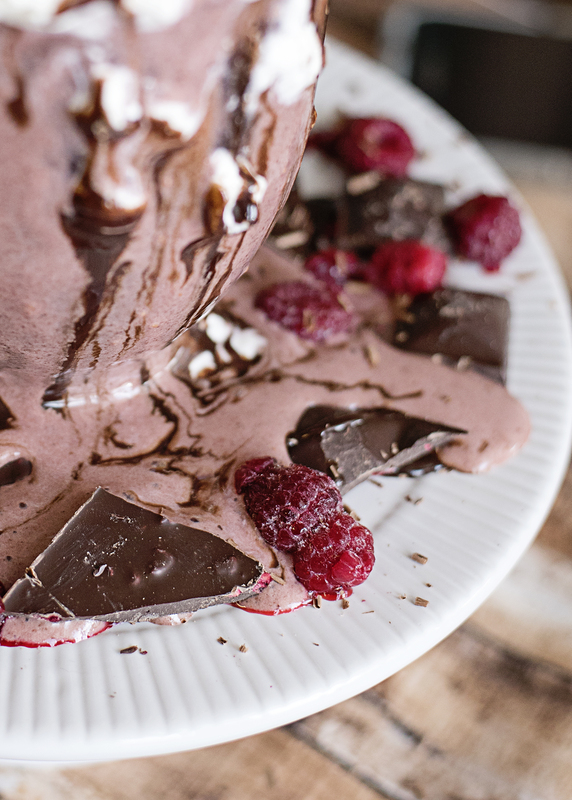 It looks so decadent, tastes like it and definitely satisfies your chocolate sweet tooth. I really hope that you have a chance to try this! For one of you, I’m giving you a chance to try Premier Protein for free! I’m running a giveaway this month for an assortment of Premier Protein bars (7 of them) and a few of their tasty shakes (3). Disclosure : This post is sponsored by PremierProtein. All thoughts are my own. Top with whipped cream, chocolate drizzle and your favorite dark chocolate bar. Enjoy! Blend all of the ingredients together in a high powered blender. If you need a little more sweetness, add a date or two to the shake.